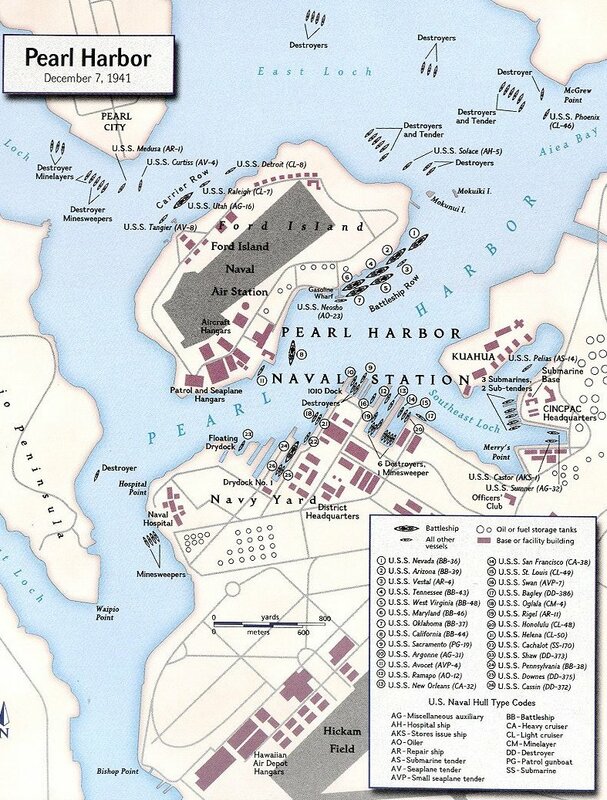 Discussion in 'Pearl Harbor' started by steverodgers801, Dec 7, 2013. Given that the Neosho was nestled amidst the battleships and collected nary a torpedo or bomb hit(although the California which was moored ahead of her took two torpedoes, and the Oklahoma which was moored astern took several) , it is probably safe to say that she was not identified as a battleship or aircraft carrier. I believe that the cruisers hit were not the targets, but hit as a result of an attack on another ship. Utah was attacked despite strict orders to leave it alone. Misidentification was a serious issue for Japanese pilots through out the war. A third wave would have required substantial preparation and turnaround time, and would have meant returning planes would have had to land at night. At the time, only the (British) Royal Navy had developed night carrier techniques, so this was a substantial risk. Weather had deteriorated notably since the first and second wave launching, and rough seas complicated takeoff and landing for a third wave attack. The task force's fuel situation did not permit him to remain in waters north of Pearl Harbor much longer, since he was at the very limit of logistical support. To do so risked running unacceptably low on fuel, perhaps even having to abandon destroyers en route home. He believed the second strike had essentially satisfied the main objective of his mission—the neutralization of the Pacific Fleet—and did not wish to risk further losses. Moreover, it was Japanese Navy practice to prefer the conservation of strength over the total destruction of the enemy. At a conference aboard Yamato the following morning, Yamamoto initially supported Nagumo. In retrospect, sparing the vital dockyards, maintenance shops, and oil depots meant the U.S. could respond relatively quickly to Japanese activities in the Pacific. Yamamoto later regretted Nagumo's decision to withdraw and categorically stated it had been a great mistake not to order a third strike. I just finished reading the Osprey account of the naval battles at Guadalcanal, and I agree with TOS. There were several opportunities for the IJN to engage the US fleet that were missed. The US would have been hard pressed to match the IJN if it was not so timid or poorly led. But none of these were optunites to engage in the "Decisive Battle". At most there were two US battleships in the area. This is also one of the affects of their strategy as well. Since the "Decisive Battle" was what would win the war they were reluctant to "waste" assets critical to it on lesser tasks. 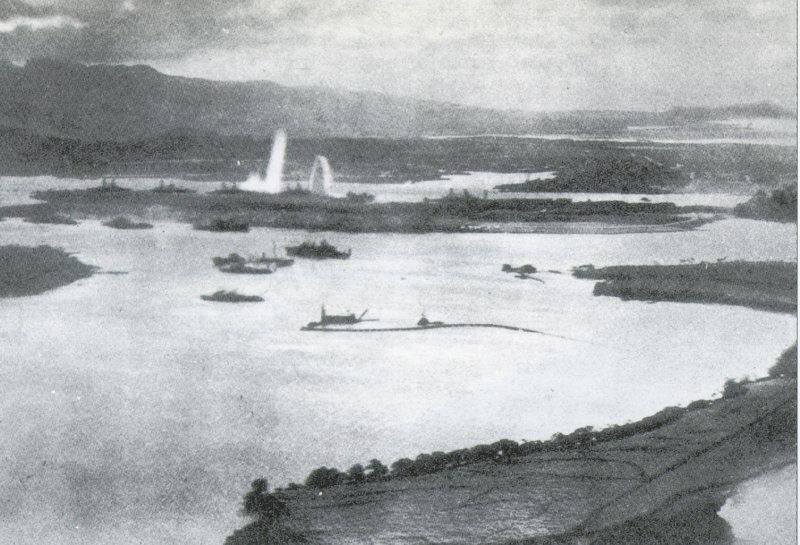 ... Several Japanese junior officers, including Mitsuo Fuchida and Minoru Genda, the chief architect of the attack, urged Nagumo to carry out a third strike in order to destroy as much of Pearl Harbor's fuel and torpedo storage, maintenance, and dry dock facilities as possible;and the captains of the other five carriers in the formation reported they were willing and ready to carry out a third strike. This is at best debateable. Fuchida certainly made this claim but there is pretty strong evidence that brings it to question. Nor is it clear that those would ahve been the primary targets. Furthermore there's the question of whether or not a third wave could have been launched that day and when it could be launched if not on the 7th. The question is though how likely would it have been that these targets were wiped out? In discussions I've seen it's been pretty clear that it would have takend several more waves to do so and may well have been beyond the capability of the IJN at that point in time. .. . He believed the second strike had essentially satisfied the main objective of his mission—the neutralization of the Pacific Fleet—and did not wish to risk further losses. Moreover, it was Japanese Navy practice to prefer the conservation of strength over the total destruction of the enemy. Indeed he had inflicted more damage than the Japanese expected and had recived far less in return. From what I recall the Japanese expected to loose several carriers. I'm kind of wondering about this. The Yamato wasn't even commissioned at that point. 1 - It would probably do well to remember that the Japanese operations order for the attack on Pearl Harbor very specifically spells out that should a third attack be launched, this being left to the commander's, Nagumo's, discretion, the load out for the B5Ns was to be torpedoes; apparently, then, any envisioned third attack was to be focused on ship killing. 2 - Yes, for a long time the USN, too, was focused on the decisive battle. Miller's War Plan Orange covers this nicely. Despite varying and acrimonious disagreement amongst planners and commanders in the forty years leading up to the war, the essence was that the USN would work it's way across the Pacific, by one route or the other, establishing bases as necessary, and fight a decisive sea battle with the Japanese somewhere north of the Philippines. I recommend a reading. IMO the strategic impact was almost completely disconected to the tactical result. An attack with no prior declaration of war whether it sucseeded or failed was goiong to generate almost the same strategic result. If they had been wiped out, "serious [American] operations in the Pacific would have been postponed for more than a year"; according to American Admiral Chester Nimitz, later Commander in Chief of the Pacific Fleet, "it would have prolonged the war another two years." That's a pretty big "if"; assuming that one strike would "wipe out" a major industrial facility. The first two strikes each comprised about half the Japanese attack aircraft, each carrier launching either dive bombers or level/torpedo bombers, so presumably a "third strike" would be similarly composed. My guess is against land targets they would use their B5N carrier attack planes in high-level mode; they had the heaviest bombloads, and in the second wave none had been shot down while the dive bombers lost about 1/6 of their number (14 out of 80). They had used 143 B5Ns of which 5 were shot down, 11 damaged beyond repair, and probably a few more could not be repaired in time for a second flight on Dec 7. So we'd have around 110-120 planes carrying 1325 (1x533, 6x132) or 1760lb bombloads, total 146-211,000lb, comparable to what 30-40 B-17s delivered in the bombing campaign against German industry - nowhere near enough to "wipe out" much of anything. Experience showed that hundreds of heavy bombers were needed to even temporarily disable major factories, refineres, or the like, and they were still usually back in service within a few months. The presumption that "third strike" equals "naval base eliminated" was and is wishful thinking. Of course they could also use their dive bombers, which had been reduced from 131 to 100 or fewer in the morning mission. These had lighter bombloads but greater accuracy against identifiable targets like fuel tanks or drydock caissons (can't tell what's inside a building though) but would be likely to suffer further heavy losses against alert defenses. I don't see this changing the total impact much. More likely they would retain the D3As to engage American ships at sea, such as the dozen cruisers and destroyers which sortied during the attack. We know today that lingering a few more hours might have brought them into contact with the Enterprise task force, which under Halsey was seeking the attackers, but the Japanese had no way of knowing that. good point here...as seen in the European theater [ Schweinfurt and Regensburg hit VERY hard/damged, but not prolonged ] and other wars, air superiority and bombings have to be ''prolonged'' to achieve the goal.. There were no more torpedos left that had the modified fins, so a third strike would not include them. There were also no more special heavy bombs left. A third strike was never discussed in the planning stages and we have only Fuchida's word that he argued for one after the 2nd strike. We already know Fuchida lied about the planes being on the decks of the carriers at Midway and he also lied about being on the Missouri during the surrender ceremony. The Japanese did not carry large enough bombs to do the kind of damage needed to really shut down the naval facilities. Finally Nagumo's decision to leave was also based on the need for the carriers to support more operations against the DEI and Rabaul. What he did may or may not have been in accord with Yamamoto's wishes, but it was in accord with what the rest of the high command wanted. I thought I remembered reading there was some discussion of a third wave but it was pretty nebulous. As it was Nagumo's carriers were intact and his airgroups in pretty decent shape. Why risk snatching defeat from the jaws of victory? I think Opana's sight has some info on the above. There were disagreements at different levels of the command chain on what the priority targets should be for the raid. The formal order from Navy General Staff for the operation designated the American land-based air power as the first priority, followed by carriers and then battleships. This likely reflected the fears of Navy General Staff that Nagumo's force would be highly vulnerable to an American counterstrike. Yamamoto ignored this in his own order to Nagumo, which gave top priority to disabling four battleships and second priority to disabling four carriers. However, Genda felt strongly that the carriers should be the priority target, and there are clear indications that his thinking strongly influenced how the operation was planned and executed. 39. Why was the air assault not continued, and why was it not followed up by surface units or by a landing? (1) The object of this attack was to destroy the capital strength of the UNITED STATES PACIFIC Fleet and to delay any attack which it might make across the PACIFIC. Hence this objective could be accomplished by air attack alone. Furthermore, since the whereabouts of the American task forces were unknown and since the chances of scouting them were small, in face of a possible counterattack in co-operation with the 50-odd remaining HAWAII-based large airplanes, the advantages of a quick withdrawal were apparent. Consequently, no naval assault was undertaken. If the land based air power has been completely knocked out, repeated attacks will be made immediately in order to achieve maximum results. However, if a powerful enemy force is in route to attack subsequent attacks will be directed against it. They did not believe that the land based air power had been "compltely knocked out" nor was it. Furthermore the location of the US carriers was in question. It's also worth comparing the level of detail in the planning of the first two waves to that of the afore mentioned follow up. hi guys just want to throw my 2p into this,my moms stepgrandad was a shell oil man he mainly worked on pipelines. (he was sent to england as a civilian tech to help figure out the oil flow for d-day) he used to tell me that if the attack had taken out the oil tanks that while there were some other resources that could be used, to rebuild the tank farms to prewar size that it would have taken at least six months but probably longer due to the fact that there was shortage of men with the proper training to build the tanks and pipes. IIRC, Zinn mentions this, and he point to the fact that there was somewhere around 125 commercial oil tankers that the USN could have confiscated and used as "floating oil tanks" until the land-based oil tanks were completed. he also gives figures on how long and how many trips would have been needed to refill the oil tanks, or refill the docked oil tankers, using varying numbers of oil tankers to transfer the oil from the States. There was another tank farm under construction. The problem with the tank and it has been discussed is that each individual tank would have had to been hit. That was the Red Hill underground complex I had already mentioned. However, underground fuel tanks are far more difficult and time consuming to comstruct than their above ground brethren.